Spray large skillet with nonstick cooking spray. Heat over medium-high heat. Add chicken; cook and stir until no longer pink in center. 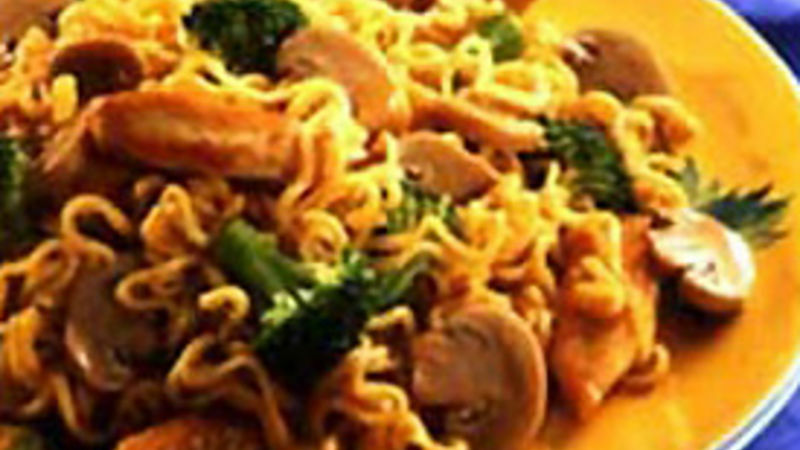 Add broccoli, mushrooms, water, soy sauce and 1 flavoring packet from noodles; mix well. Bring to a boil. Break noodles in half crosswise; add to chicken and vegetables. Return to a boil. Reduce heat; cover and simmer 5 to 10 minutes or until broccoli is tender, stirring occasionally to separate noodles.